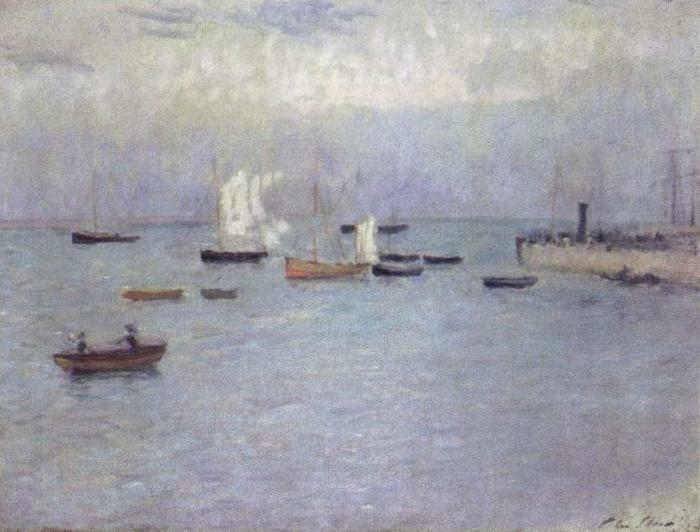 Philip Wilson Steer studies art in France during the years 1882 and 1884, and then returns to England. In Paris, he meets the impressionists of the end of the century, who will influence his style. However, he will take only certain elements from them: Steer’s work will copy the technique and will mimic the study of light; but he will reject the vibrant colors, choosing a darker and duller palette. In Poole Harbor, we’ll see a landscape of the coast of Dorset, southern England. In it, we’ll notice several little boats, many of them with sails. We can see only two characters, probably fishermen, in the foreground at the left. Here Steer uses a palette with earthly colors and the painting results melancholic and depressive. Despite the rest of his work is clearer, in Poole Harbor, the elements of the composition seem diffuse and phantasmagoric. ~ by Álvaro Mazzino on May 9, 2011. The iPhone 6S and 6S Plus come with upgraded processors and twice as much RAM as the 6 and 6 Plus, which helps to ensure that the handsets are smooth and fast. You soon take the extra speed for granted, say reviewers, but you notice its absence if you step back to last year’s model. Rumors are swirling that there are a number of Off-White x Nike products in the works, including an Off-White x Air Jordan 3 collab which is expected to make its debut sometime this month. Building off of the original ZERØGRAND Wingtip Oxford, a shoe we named as the most comfortable shoes you can wear to the office, the 2.ZERØGRAND Wingtip Oxford with Stitchlite is a shoe that both sneaker collectors and fans of maximum comfort will love. This entry was posted on May 9, 2011 at 15:08 and is filed under Impressionism.You can follow any responses to this entry through the RSS 2.0 feed.You can leave a response, or trackback from your own site.